DTT: It may come as a shock that majority of terror attacks were committed by individuals who did not have Islam as their faith. This fact sadly gets never reported by the mainstream media. Muslims being branded as the bad guys in the media is sadly rampant among those who want to dehumanise Muslims. To the extent, when propaganda is spread this affects innocent, and law-abiding Muslim citizens. Islamophobia, hatred and attacks against Muslims has increased dramatically over the years. 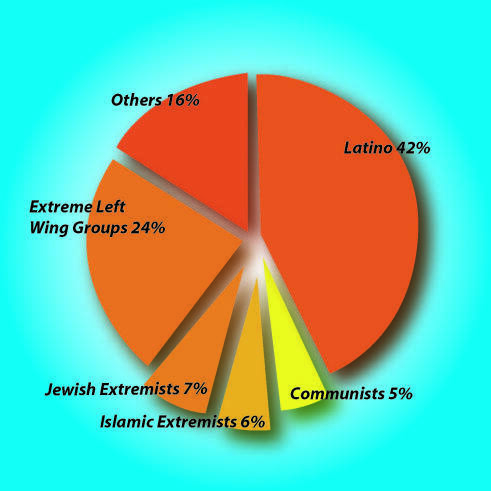 Of the more than 300 American deaths from political violence and mass shootings since 9/11, only 33 have come at the hands of Muslim-Americans, according to theTriangle Center on Terrorism and Homeland Security. The Muslim-American suspects or perpetrators in these or other attempted attacks fit no demographic profile—only 51 of more than 200 are of Arabic ethnicity. In 2012, all but one of the nine Muslim-American terrorism plots uncovered were halted in early stages. That one, an attempted bombing of a Social Security office in Arizona, caused no casualties. Since 9/11, [Charles Kurzman, Professor of Sociology at University of North Carolina at Chapel Hill, writing for the Triangle Center on Terrorism and National Security] and his team tallies, 33 Americans have died as a result of terrorism launched by their Muslim neighbors. During that period, 180,000 Americans were murdered for reasons unrelated to terrorism. In just the past year, the mass shootings that have captivated America’s attention killed 66 Americans, “twice as many fatalities as from Muslim-American terrorism in all 11 years since 9/11,” notes Kurzman’s team. The sample of Muslim Americans turning to terror is “vanishingly small,” Kurzman tells Danger Room. Measuring the U.S. Muslim population is a famously inexact science, since census data don’t track religion, but rather “country of origin,” which researchers attempt to use as a proxy. There are somewhere between 1.7 million and seven million American Muslims, by most estimates, and Kurzman says he operates off a model that presumes the lower end, a bit over 2 million. That’s less a rate of involvement in terrorism of less than 10 per million, down from a 2003 high of 40 per million, as detailed in the chart above. Yet the scrutiny by law enforcement and homeland security on American Muslims has not similarly abated. The FBI tracks “geomaps” of areas where Muslims live and work, regardless of their involvement in any crime. The Patriot Act and other post-9/11 restrictions on government surveillance remain in place. The Department of Homeland Security just celebrated its 10th anniversary. In 2011, President Obama ordered the entire federal national-security apparatus to get rid of counterterrorism training material that instructed agents to focus on Islam itself, rather than specific terrorist groups. Kurzman doesn’t deny that law enforcement plays a role in disrupting and deterring homegrown U.S. Muslim terrorism. His research holds it out as a possible explanation for the decline. But he remains surprised by the disconnect between the scale of the terrorism problem and the scale — and expense — of the government’s response. We agree. And so do most Americans. Indeed – as we’ve previously documented – you’re more likely to die from brain-eating parasites, alcoholism, obesity, medical errors, risky sexual behavior or just about anything other than terrorism. Kurzman told the Young Turks in February that Islamic terrorism “doesn’t even count for 1 percent” of the 180,000 murders in the US since 9/11. Specifically, we reviewed all of the terrorist attacks on U.S. soil as documented by the National Consortium for the Study of Terrorism and Responses to Terrorism (START). (2012). Global Terrorism Database, as retrieved from http://www.start.umd.edu/gtd. The START Global Terrorism Database spans from 1970 through 2012 (and will be updated from year-to-year), and – as of this writing – includes 104,000 terrorist incidents. As such, it is the most comprehensive open-source database open to the public. We counted up the number of terrorist attacks carried out by Muslims. We excluded attacks by groups which are obviously not Muslims, such as the Ku Klux Klan, Medellin Drug Cartel, Irish Republican Army, Anti-Castro Group, Mormon extremists, Vietnamese Organization to Exterminate Communists and Restore the Nation, Jewish Defense League, May 19 Communist Order, Chicano Liberation Front, Jewish Armed Resistance, American Indian Movement, Gay Liberation Front, Aryan Nation, Jewish Action Movement, National Front for the Liberation of Cuba, or Fourth Reich Skinheads. We counted attacks by Al Qaeda, the Taliban, Black American Moslems, or anyone who even remotely sounded Muslim … for example anyone from Palestine, Lebanon or any other Arab or Muslim country, or any name including anything sounding remotely Arabic or Indonesian (like “Al” anything or “Jamaat” anything). DTT: There you have it! Next time an online bigot types that vast majority of terror attacks in the West was done by person(s) with a Muslim name, present these facts to them to refute them. Thanks for sharing this vital information enough to dispel all Islamophobia.